One of the things I will miss most about Brazil when we move later this year is the friendships I have made here. Not only with Brazilians, but with the vibrant and interesting ex-patriate community. The true joy of being based in a country not your own is who you find in a similar situation. The club I belong to, the International Newcomers Club, is diverse, and fun, and not what you think. We don't all stand around and complain about traffic and expensive toys while sipping Earl Grey. But I will talk about that club another day. The main point is that through this club I have made one of my closest friendships here. Erica is a smart, funny, and incredibly sympathetic American-Brazilian. She is more American than Brazilian--her Portuguese is as accented as mine--but she is the daughter of a Brazilian mom and an American dad. Our kids play soccer together, and I treasure the hour a week where we sit around the soccer field and chat. After knowing Erica for a while, I discovered that I "knew" her husband. Her husband is a Reuters journalist, probably the best-known one here, and also works as a ghost writer. 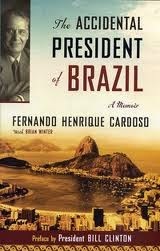 His most recent book will be released next week and was written with Pele. His one before that was with Uribe, the former president of Colombia, and the best-known one is The Accidental President written with former Brazilian president, Fernando Henrique Cardoso. And that was a book I had read just prior to my move to Brazil. I didn't meet Brian for almost six months after meeting Erica--I used to call him the Imaginary Husband. Erica would talk about him, but we had never met. I will tell you this: he writes beautifully. I can see why all these folks want to hire him. Not only that but he is smart and funny just the same as his wife, though the sympathy is more objective. All the best journalists have that. 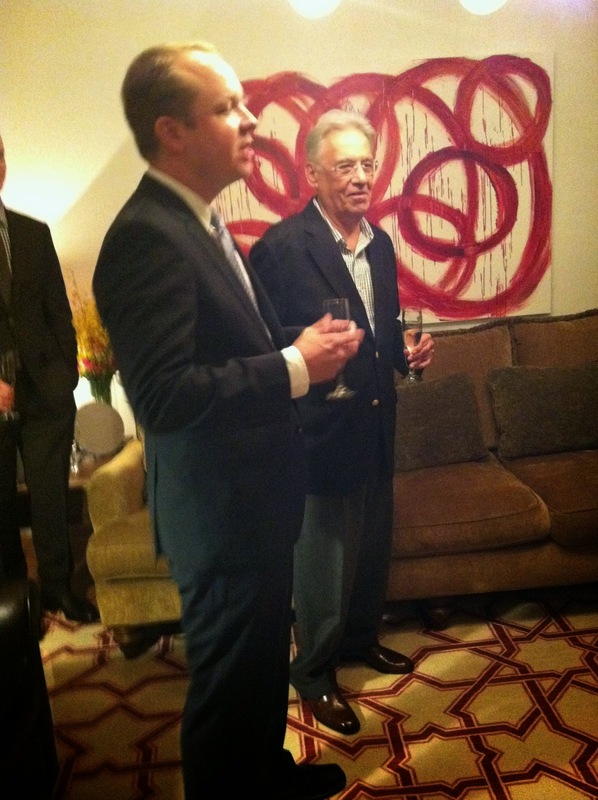 Last night, we were invited to a small cocktail hour to celebrate Mr. Cardoso. It was held in a nice apartment in the chic Jardins area, and hosted by someone that I never actually saw at the party. And by our friends. Probably 30-40 people were there--many of them in their 30s and most non-Brazilians. I arrived around 7:30 for a 7 pm start--the place was hopping. Mr. Cardoso was expected at 8 pm. Brian gave a wonderful speech about working with Mr. Cardoso and then the former president spoke (in Portuguese--I had not realized his English was not great--see, Brian is a great writer as that does not come out in the book) glowingly about working with Brian. I admit to a tear in my eye. After the speeches, I managed to overcome my own shyness and told Mr. Cardoso that his book was the very best history lesson I'd had about Brazil. And it's true. 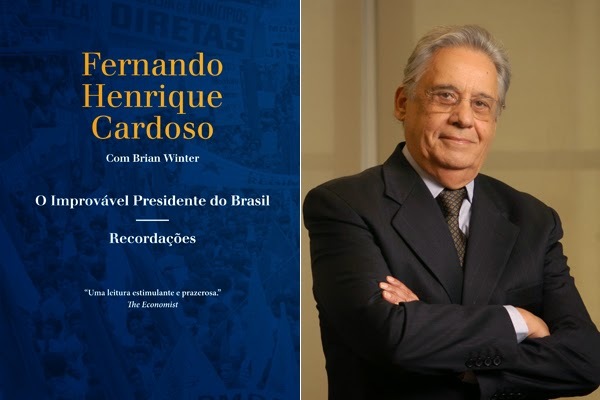 If you haven't read it, and you don't mind the marketing message here, I highly recommend The Accidental President by Fernando Henrique Cardoso with Brian Winter. I'm going to be first in line for Pele's book next week, too. Thanks for the invitation, friends. Did you do the honorable thing and ask him to please, please, pretty-please, run again for president? I know he wouldn't win but I, for one, would finally get around to updating my voter's registration so I could vote on him. Hahahaha! Yeah, I know an awesome journalist and writer who knows the former president. And Pele. And some Colombian dude. I have also, by the way, met Dilma. Briefly, while she was a candidate for president. At Jacques Wagner's house in Salvador. We went because the president of BH's husband's company could not be there. All I can tell you is that she smells very nice and has nice skin. I wouldn't (and can't) vote for her. Funny you say that about the English version. I am going to ask why it was released first in English (in 2006) and just this year in Portuguese. I am also going to ask him why the cover of the Portuguese version is so ugly. Do Brazilians know how to market? Seriously. I think I'll update my blog right now with the Brazilian version, and with a photo I took with my iphone of Brian and FHC. I was thhhaaaat close. 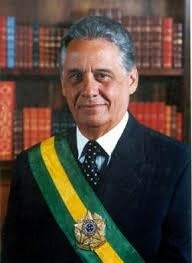 He doesn't smell as nice as Dilma, but then again he doesn't have to. I did not ask him to run. He's busy being Academy of Arts and Letters. By the way, I have to say that the complete lack of "frescura" was amazing. No secret service, no "what am I do here with this bunch of gringos?" I haven't seen the Brazilian cover but I can imagine it's not as slick. Have they at least got the spine text right? It really bugs me how some publishers in Brazil insist on printing text going up on the spine. Downwards is better but they could at least agree on a standard. Okay...so here's the answer on why English first...directly from Brian: "Complicated! (sort of.) My original task was to translate his 701-page Portuguese memoir that he wrote himself, and maybe add some context. When I saw that would be kind of tough for a US audience, we ended up doing a book that was 98% different in its content and written overtly for foreigners. The book was only translated to Portuguese last year because he's done a lot of other books in recent years for the Brazilian audience, and the market for FHC titles was pretty saturated here." I just noticed the Brazilian cover now. It isn't as bad as I feared. To be fair, the old-style photo of Rio is a bit of a cliche that's just there to illustrate the main word on the cover "Brazil". It doesn't relate to his story (I don't think) like the "Diretas" poster card. But they still could've jazzed it up a little.